So you’ve got yourself a decent hi-fi system, but you fancy something better than an iPod dock or a portable radio in the kitchen? Or maybe you’re lucky enough to have what they used to call a study, and is now a home office? Then again, perhaps you’re living in a shoebox-sized studio apartment – when did they stop being bedsits? – and want to play music as well as having an alarm set-up to get you awake, on the treadmill and earning enough to meet the mortgage payments? 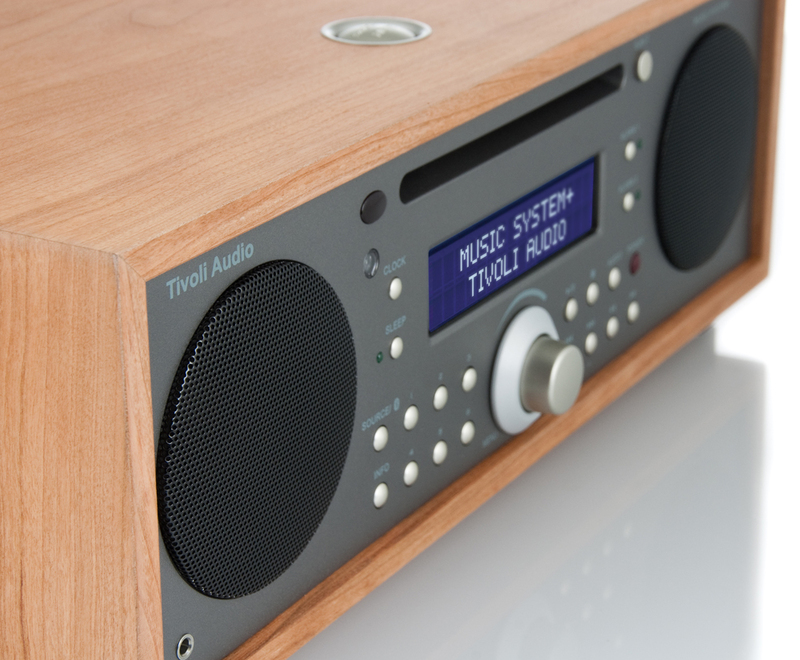 In any of those cases, the Tivoli Audio Music System + could be just the thing. Selling for £699, and available now from John Lewis, it’s essentially the existing Music System model, but now with the addition of DAB+ and Bluetooth connectivity, but if you’re coming to it afresh the ‘plusness’ will hardly be relevant. What will be is that this is a well-sorted, great-sounding little package, more compact than even the most micro micro-system and, in typical wood-wrapped Tivoli Audio style, quite a looker. Tivoli Audio has always set its own style. The Boston, Massachusetts company launched with the logically-monikered Model One, which appeared some 13 years ago: it was a wood-clad, mains-powered ‘table radio’ of the kind most thought had long since been consigned to history. An AM/FM model, designed by Henry Kloss – then in retirement following a career taking in KLH, Advent and Cambridge SoundWorks – it used technology developed for mobile phones to improve selectivity, had a large tuning dial looking (and feeling) like it belonged on some precision technical instrument, thanks to low gearing designed to make precise tuning possible, and was of course mono. Mono? Of course: though at the time the nay-sayers suggested that if no-one wanted a wood-cased static radio in 2000, no-one at all wanted one only able to receive broadcasts in mono. Well, clearly they did, because it worked: thanks to a hefty 7.6cm drive unit with a bass-reflex port, that ability to discriminate between even close-packed radio stations (good for city-dwellers), and a $100 price-tag, the Tivoli Audio Model One rapidly became not just an object of desire, but also something of a style icon. Seems its combination of industrial chic and echoes of classic Scandinavian design, just a little bit retro, touched a nerve – soon Tivoli found it wasn’t alone with its design thinking, and the idea of modern technology plus traditional materials, once the mainstay of hi-fi components, found a new market in the ‘lifestyle’ sector. For Tivoli, many models followed, keeping it ahead of the ‘me too’ brigade: there were stereo versions, portables, separates (CD players, speakers and so on), and eventually the company made all-in-one music systems, rather like miniature versions of the radiograms of old. The Music System + is the latest iteration of that all-in-one design: wrapped in its sleeve of real oiled wood are combining a CD player, DAB/DAB+/FM tuner with six presets each for digital and analogue radio, that Bluetooth capability to allow music to be streamed from smartphones, tablets and computers, and a full suite of alarm/sleep/snooze functions. The system still uses the 7.6cm drive unit size of the original Model One – there are two, each driven by its own amplifier – and there’s also a downward-firing 13.3cm bass unit, with a rear-mounted control to adjust its gain relative to the main speakers. As well as the Bluetooth input, which uses the A2DP profile, there are auxiliary audio inputs – one conventional, the other mixing its sound with whatever else is playing – and record and headphone outputs, all of these on 3.5mm stereo sockets, plus of course the slot-loading CD mechanism. Most controls are duplicated on a little remote handset, and the system comes complete with battery back-up in case of power-cuts, and a fitted telescopic antenna. 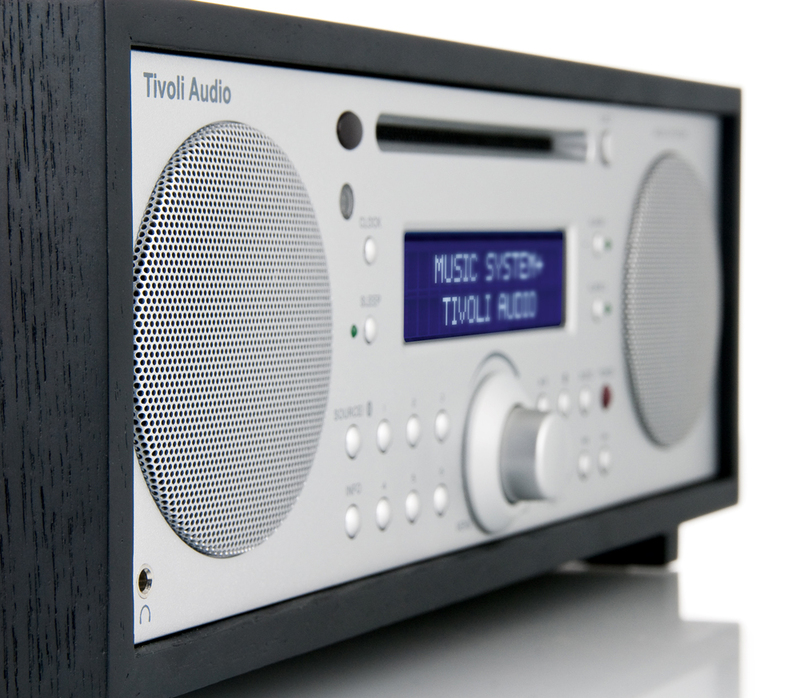 Setting up the Tivoli isn’t tricky: insert the back-up batteries for the clock, connect to the mains, set the DAB tuner to scan for stations, wander off to let it do its thing, and within a couple of minutes it’s blasting out Absolute Radio at ear-splitting levels. With that tamed, this is an excellent system for use in a small room, or as a second-room set-up: it’s compact – though despite the sleep/alarm/snooze functionality perhaps a bit big for a bedside table – and, after a bit of fiddling with the audio settings, sounds both clear and well-weighted. I’d avoid the ‘SpacePhase Wide’ setting, designed to give a wider stereo image, and stick to standard stereo – I thought the setting delivered more phase than space, whether listening close-up or across the room, and the effect was strangely disconnected and disorientating. In terms of tonality I found a slight increase in the treble setting, while turning the rear-panel bass knob to just a tad below the System detent position the manual suggests gave the best balance of clarity and weight. The Tivoli is far from lacking in bass warmth – which plays a major part in its ability to fill even quite large rooms with pleasing sound – , and overenthusiastic use of the woofer can find it swamping the rest of the frequency range. However, due to the downward-facing woofer, your mileage may vary according to the kind of furniture on which the system is placed, and the proximity of walls: on an underdamped shelf you’re likely to need a bit less bass level than you would with the system on a heavy, solid sideboard or whatever. Most impressive is the clarity of radio reception achievable with that telescopic antenna: clearly Tivoli hasn’t lost its founding ability when it comes to the good old wireless, and both digital and analogue tuners worked very well indeed. Usually I need one of my roof aerials to avoid squelchy break-up on DAB or hiss on FM; no such problem with the Tivoli. The Bluetooth implementation also worked well, even though I’m no great fan of streaming music from a handheld device to speakers and systems like this, feeling the sound lacks a certain ‘bite’ compared to CD playback or other streaming methods. I guess it’s convenient, but I really don’t quite get it – but then I tend not to listen to music on my assortment of iOS devices, so that may be the reason. Whether playing CDs, the radio, or other sources, the Tivoli always sounds rich, smooth and eminently listenable: yes, the overall balance is a bit lush and safe, and that spot of treble boost injects some extra life. That done, this is a set-up able to play loud and clean, delivering surprising levels – and not just with Absolute Radio! – and as convincing with classical music or speech radio as it is with mainstream rock, pop and the like.